Over the past several years, the number of articles about physician burnout has grown exponentially. Whether it is coverage in the New England Journal of Medicine, Journal of the AMA, or any well-respected publication, the impact has been enumerated in great detail. Stressors are accumulating for physicians, with Sinsky et. al. reporting in the Annals of Internal Medicine (December 6, 2016) that doctors on average are spending only 27% of their time with patients. The remaining time is taken up with EHR, desk work and other activities. With increasing patient loads and less direct support, it is no wonder that in a survey of over 5,000 physicians (The Doctors Company, February 29, 2012), only 10% would recommend healthcare as a profession. Practicing physicians must reconcile these challenges with increased legal risks, and often burdensome student debt repayments. The result of this accumulated stress is that physicians have an increased risk of relationship difficulties, substance abuse, depression, and even suicide. As devastating as this can be for the individual physician, the impact cascades throughout medical institutions, in the form of decreased quality of care, lower patient satisfaction rates, poor productivity and higher turnover. Shanafelt, et. al. published a detailed business case for investing in physician wellbeing in JAMA Internal Medicine (September 25, 2017 online edition), illustrating the substantial costs of inaction. The symptoms of the problem can look very similar across healthcare organizations, but the underlying causes are always unique. 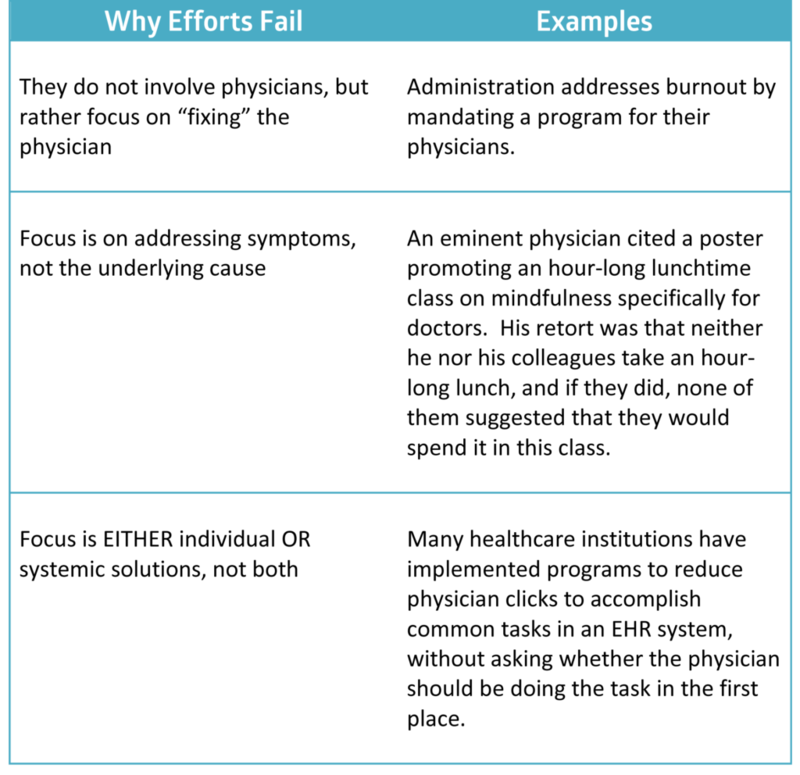 It is for this reason that many well-intentioned efforts to address the problem do not accomplish their goals. No one created the burnout problem on purpose… but few people understand how to create a healthy, resilient organization. Most organizations simply lack the knowledge and competency to reverse the damage. Are your employees giving you their energy... or just their hours? Employers want employees that are willing to give their best; yet it seems our efforts to create this type of workplace fall short. 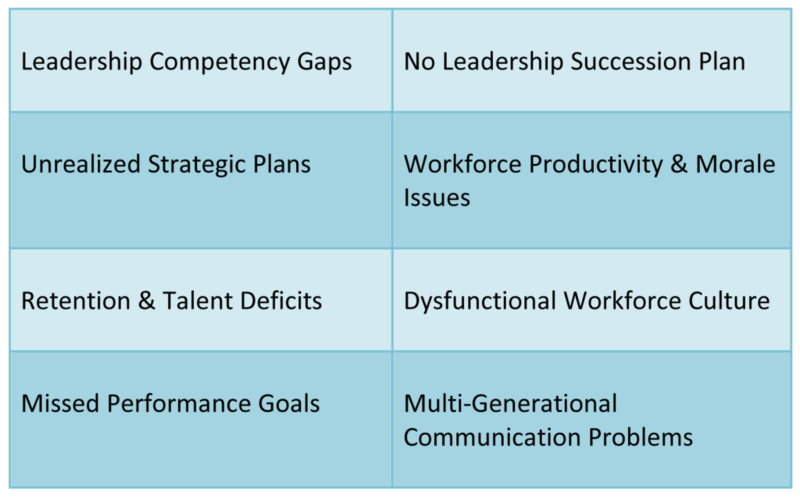 We struggle with how to get the best from our workforce. When employees bring their best, the company is more productive. Communication, collaboration, innovation are all better. Think about that engaged employee at your company. They work hard and accomplish more because they want to – not because someone is making them do it. Now consider disengaged employees. They put in hours instead of energy, with a minimum of effort and complete each day unsatisfied and frustrated. It’s a lose - lose situation for both the employer and the employee. Gallup estimates that 70% of the US workforce is not engaged and that 65% of managers are not engaged. Managers spend about 18% of their time dealing with issues related to disengaged or under-performing employees! They offer pay incentives, employee recognition programs, management training, invest in performance management systems, they spend billions of dollars. Yet, these efforts are short lived – never getting what they really want in the long term – fully engaged employees. 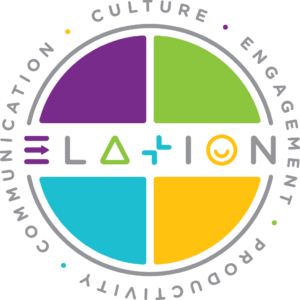 Enroll in an Elation Academy Online Course Today! Would Batman or Wonder Woman see it the same way? "Elation is indeed a catalyst. I highly recommend Elation because the methods truly focus on your mindset, even if you are a positive motivator for your team. The experience helps people lead themselves and teams much more effectively and efficiently."